An ultra contemporary Nantucket Basket Purse with a narrow oval shape and a chevron design woven right into both the front and back of this open oval Nantucket Purse Basket, enhanced with a braided leather shoulder strap. Finely crafted with a walnut hardwood Nantucket wood base, hand-tapered and beveled cane staves and fine Nantucket-grade cane weaving. The staves are meticulously hand-placed with only a whisper of space between them - just enough for the fine cane to pass between. The basket rims are traditional rattan reed, Anyline dyed multiple times to achieve the rich deep walnut color which accentuate and contrasts with the creamy colored cane basketweaving. The basket rims are pre-drilled and nailed with thin brass escutcheon pins, which have been cut flush and peened over flush, then sanded smooth. 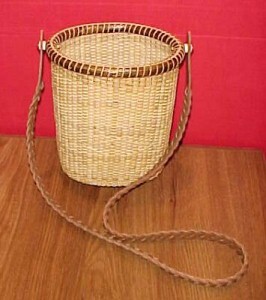 A stitched or braided brown leather shoulder strap is attached to this Nantucket Purse Basket with flat bone or ivory knobs and washers and a brass handle pin. The single chevron design woven into both the front and the back of this basket purse gives another contemporary and classical design element and texture to the weaving of this purse. This deep basket purse is compact and perfect for holding everything you could possibly need. Excellent craftsmanship and attention to detail. A draw-string fabric liner could be added (not included) to give additional protection to the basket purse and safety for your personal items. Measuring 8" high, 6" side to side and 4.5" front to back, it will be been given multiple coats of varnish inside and out to protect, strengthen and bring out the beauty of the natural materials. The stitched or braided leather shoulder strap is crafted of top quality purse leather. This Nantucket Basket Purse will be signed and dated by me, as are all my fine Nantucket baskets. Although I am no longer accepting orders for the Oval Nantucket Basket Purse Chevron, I do craft one or two of these per year. When its ready for sale, you can purchase it directly from my Simply Baskets website.